Doors and wristband exchange (in the entrance to The Customs House) will be open from 11.30am. Vintage Village and all other areas will open at 12.00pm. Bernicia Festival are proud to announce their line-up for their inaugural year. Taking place on Sunday August 4th at The Customs House, South Shields, we are delighted to be joined by some of the best artists the North East has to offer. 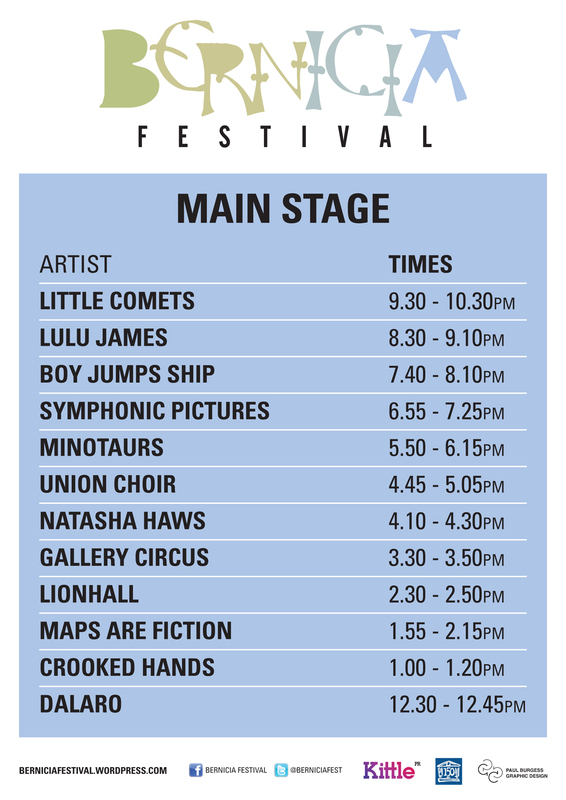 Headlining the festival will be Little Comets. One of the best and most successful acts the North East has ever produced, Little Comets have been winning over audiences worldwide with their kitchen sink indie rock. Joining them will be Lulu James. Hailing from South Shields, Lulu James is set to take the world by storm with her emotive electronic soul, and will soon be joining chart-topping pop songstress Emeli Sande as her European tour support. Boy Jumps Ship will be bringing a rockier edge to proceedings, having been dubbed by Kerrang Magazine as displaying “enigmatic sound bites nestled between soaring refrains that wouldn’t disgrace Biffy Clyro.” Further representing Bernicia’s founding town is Natasha Haws, whose first single was released last year, garnering praise from BBC Radio One’s Huw Stephens among many others. Also performing on the main stage will be the elusive and brilliant Minotaurs. Formed in South Shields in 2006, the outfit gave weight to their name as performances by the band became less frequent, their mythology grew, with gigs now being treat with a similar reverence as the sniffing out of a truffle. We also welcome the stunningly melancholic pop of The Union Choir, which has been intoxicating fans of The Smiths and The National all around the country, garage rock duo Gallery Circus; a unique and abrasive blues-rock outlet famed for delivering breathtakingly powerful live shows, dark pop purveyors Maps Are Fiction, and the luscious alternative folk of Crooked Hands. 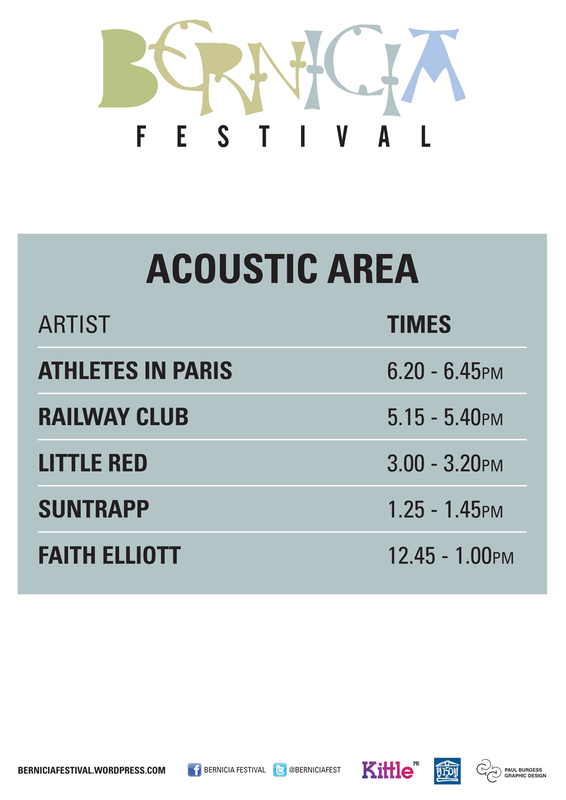 As well as the main stage, you’ll also be able to catch acts in our Acoustic Corner; headlined by quirky Newcastle lads Athletes in Paris, they’ll be joined by chamber pop favourites The Railway Club, up-and-coming singer songwriter Faith Elliott, the uplifting indie-folk of Suntrapp, and South Shields’ own Little Red. Hosted in The Customs House, the riverside’s historic arts venue, Bernicia will bring together a legion of incredible creative talents sourced directly from the North East itself. An all-day celebration of the town’s musical community, Bernicia provides a long-needed alternative to the mainstream pop-based events of the summer. You won’t find the teeny-boppers, the one-hit wonders, or the cursed mud-slides here; just spell-binding home-grown music, a chilled-out atmosphere, and a gorgeous, historic location. Bernicia arrives as The Customs House celebrates its 150th year serving the North East. Taking over The Customs House’s stunning theatre, bars and gallery spaces, Bernicia will utilise the spaces that the creative industry have occupied since the opening of the Grade II Listed building in 1814. We believe that the finer things in life should be accessible to everyone, which is why Bernicia will be absolutely free. Nowhere else will you find quality music, drinks and great times, all for the price of an air guitar.